Editor’s Note: It is with heavy hearts that we must say goodbye to our dear friend and long time Biker Belles supporter Cookie Ayers-Crum. This article, which was to serve as a celebration of a living motorcycle legend, must now act as a memorial to the legacy she left behind. Cookie Ayers-Crum passed away on June 3, 2015 after leading an inspiring life that helped pave the way for countless women in motorcycling. She will be greatly missed. People who meet Cookie Crum only see her as a beautiful woman. She is quiet, cultured and polite. Quiet, that is, until motorcycles come into the conversation, That’s when the “Queen of the Hell Drivers” has a world of experience to talk about. 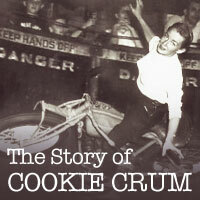 Cookie’s husband Bob Crum had been a friend of mine, and once when the subject of motorcycle riding came up in a group conversation, a spark flamed in Cookie’s eyes. That was when I discovered that this beautiful older woman was in fact motorcycle icon Cookie Ayers, “Queen of the Hell Drivers—Queen of the Daredevils”. intervened and changed the direction and name of the young star. 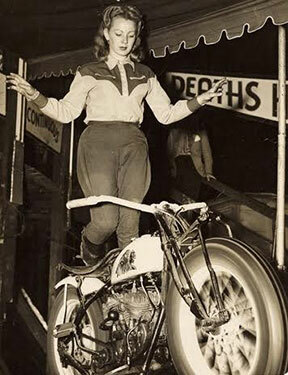 In 1949, there were many “motordromes” traveling the United States, but only one or two women riders who risked their lives performing in them. Margery got hooked on the idea, changed the facts of her age a bit to get the job, grabbed the stage name “Cookie Ayers” and rode the wall for eight years. While many died during performances, Cookie rode fearlessly during her shows—often standing on her bike like a ballerina. For more than 60 years Cookie rode her own full dress bagger and cruised everywhere as a motorcycling ambassador to the public. When they met her, people often commented, “You don’t look like a motorcycle rider.” She would answer them with the question, “What does a motorcycle rider look like?” Traditionally the big division between motorcycle riders and public perception had simply been a misunderstanding. The 1947 Fourth of July fiasco in Hollister, Calif. and movies like Marlon Brando’s “The Wild Ones” had characterized all motorcycle riders as outlaws, but Cookie distanced herself from this stigma by always riding in public in her flashing white boots and white riding jacket and showing everyone she was a lady. Black leather was the uniform of outlaw bikers in the public’s eye. “The Queen” was not that one percent; she was the ambassador for the other 99. In 2009, 77-year-old Cookie Crum attended the Sturgis Rally, where the Sturgis Motorcycle Hall of Fame had invited her to be inaugurated. 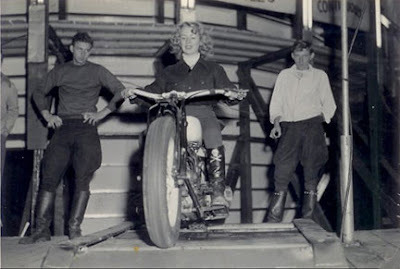 Those who had known her during her Wall of Death days already called her “The Queen,” and those who had met her over the 52 years of riding that followed knew her as “The Lady.” Before it became official, she was already Hall of Fame in motorcycling’s heart. During the 2014 Sturgis Rally, one of the large draws was the highlight of the society of riders who rode the Motordrome Wall of Death over the years, and several venues were set up around town where rally-goers could still see these performers in action. The Sturgis Motorcycle Hall of Fame was central to this activity, and once again Cookie Crum was slated to attend to be honored by the hundreds of thousands of bikers who had ridden to this steel rodeo. But in May, Cookie fell at home and ended up with a badly broken leg. When I asked Bob about her condition, he said she would eventually mend, but she was terribly saddened to be unable to be in Sturgis for her friends and the honors. Cookie’s sadness troubled my heart every mile of the 1700 I rode on my way back to Sturgis and the Buffalo Chip Campground. 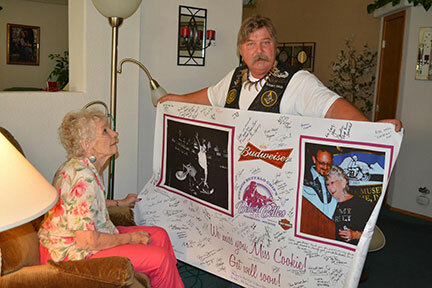 I knew I had to bring something back to Miss Cookie to let her know there were thousands who missed her and loved her for what she had done for the motorcycling community. I set out to obtain a banner for riders to sign with sentiments for Cookie. Going the citizen route once again worked this year, and I didn’t need to cut a banner off a barbed wire fence in the middle of the night! Instead, I made my ride up to the business offices at the Buffalo Chip, and the ladies downstairs who were busy preparing for the Buffalo Chip’s annual Biker Belles® event quickly came up to ask how Miss Cookie was doing and express how sad they were she couldn’t attend. Their agreement to help was immediate, and they assured they would come up with something and would call. Early the next morning, way before the previous night’s liquid entertainment had worn off, they called. “We’ve decided we needed to do something a little more special for Miss Cookie, and we had this banner made up for you,” they said. Two of the photographs I had laminated to show people had been blown up and printed on the banner, and the Buffalo Chip Biker Belles logo was centered with “We miss you Miss Cookie!” and “Get well soon!” printed below. The Budweiser distributor and Buffalo Chip Campground had really come through. During the following week, hundreds of people stopped by the “Canada Corner Camp” at the Chip and signed the banner. The Biker Belles had it at their ride, and may women riders signed with heartfelt sentiments. Participants in the Chip’s Legends Ride® signed the banner also. 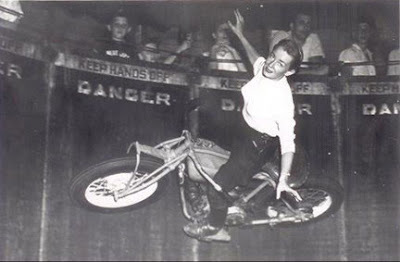 When Sturgis Motorcycle Hall of Fame executive director Christine Diers heard of the efforts, she requested the banner be brought to their building for riders to sign while they honored Miss Cookie and the others who had ridden the Wall of Death. At week’s end, I rolled the banner up, tied it to my bike, and rode with it for 1700 miles back to the West Coast. That following week, we made the arrangements for the Widows Sons Masonic Riders Association to present the motorcycling world’s sentiments to our Queen. It is said a man who causes a woman to cry is not much of a man. Well, maybe not in every case, because when the banner was unfurled and shown to Cookie, she gasped at the names, and tears welled up in her eyes at the realization of their sentiments. I must have still had a bug in my eye from the long ride, as I too had to wipe my face with my sleeve. Yep, even old dogs like me find their tender spot once in a while..